Certain natural scents repel mosquitoes, but not all plants and scented products promoted for repelling mosquitoes prove effective. 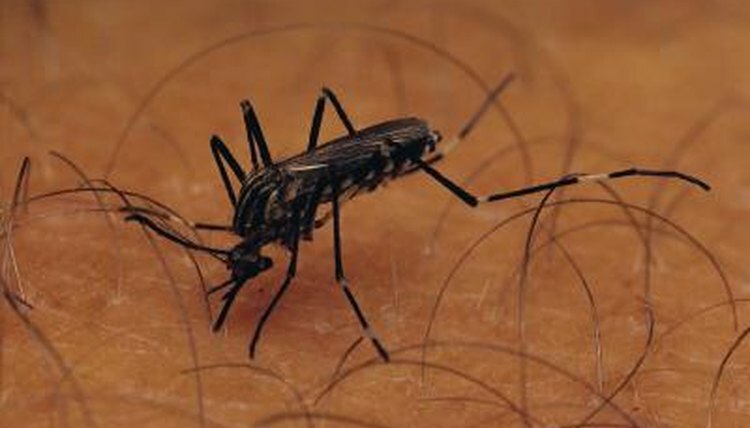 Mosquitoes are more than itch-inducing nuisances; their bites can spread disease, including West Nile virus. For working or playing outdoors, you'll need mosquito repellent. Chemical repellents such as DEET contain known neurotoxins proven harmful to people, especially children. Enjoy outdoor activities with tested natural scents for getting rid of mosquitoes. One of the best ways to get rid of mosquitoes is to dump containers of standing water. Mosquitoes use these to breed. It's alright to have birdbaths and fountains. Remove plant debris from them regularly, and keep the water fresh. Basic maintenance keeps your outdoor water features from becoming mosquito breeding areas. The decay of organic matter in standing water attracts mosquitoes. Scents have a long history in the drive to keep mosquitoes away. Garlic has a slight repellent effect. Citronella is one of the most widely available, often in candle form, -- solid candles and tiki-type oils are common -- yet there may be more effective options than these. The "Mother Earth News" website debunked the "mosquito plant," a lemon-scented geranium marketed for repelling mosquitoes. In trials with volunteers, mosquitoes landed on the plant as well as on people sitting next to it. Natural scents proved effective at repelling mosquitoes include thyme, catnip, sacred basil -- also called tulsi -- lime basil and rose-scented monarda, the website reports. Mixtures of coconut oil and lemon eucalyptus, and soybean oil and geranium oil, repel mosquitoes but only for short periods, the Extension Disaster Education Network website reports. Reapply natural repellents frequently when working or exercising outdoors. Mosquito-repelling herbs such as thyme and catnip will grow in pots for use in window boxes, on patios and near doors. You can also plant them throughout your yard or in container gardens. Snip sprigs of the plants to rub on your skin before going outdoors. Cut branches of the plants to spread on the deck or ground before a party so the scent is released as people tread on them, "Mother Earth News" suggests. Bunches of the herbs in bowls or vases make attractive mosquito-repelling decorations on picnic tables and are convenient to take along for gatherings away from home. Tie bundles of your favorite to attach to a backpack, purse or jacket for a carry-along repellent. Certain products containing oil of lemon eucalyptus, OLE, offer another botanical scent option for getting rid of mosquitoes, according to the Centers for Disease Control and Prevention. Look for repellents registered with the Environmental Protection Agency to choose a safe and effective botanical mosquito repellent. Essential oil of lemon eucalyptus, the pure oil extract, hasn't been tested and isn't recommended, the CDC advises. Wear light-colored clothing that covers most of your skin, such as pants, caftans, long skirts and long sleeves. Screen tent structures keep out mosquitoes and other flying insects when you're enjoying outdoor meals.